This mountain fortress was originally known as Orcfather's Forge when it was built in the tenth century of the First Era. 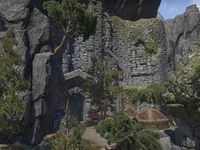 It was abandoned after Orsinium fell in 1E 980, but it has recently been reopened and renamed. Paragon's Remembrance is a ruin found just northwest of Friendship Gate. It serves as the headquarters of the Vosh Rakh.